considering that Gaijin's War Thunder is still in Beta, there are remarkably few bugs. But this one, reported by Wolfman, made me laugh. "Interesting little bug I found on Rice Terrace map. At the airport there are several big hangers off to one side of the runway. I landed for repairs but saw a high level bomber inbound. 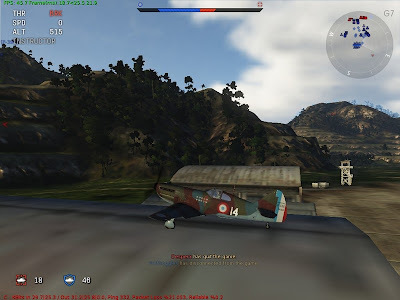 I taxied into one of the hangers and the bombs missed me. Unfortunately when the plane repaired and respawed I was on top of the hanger. I tried, not enough distance to take off!"